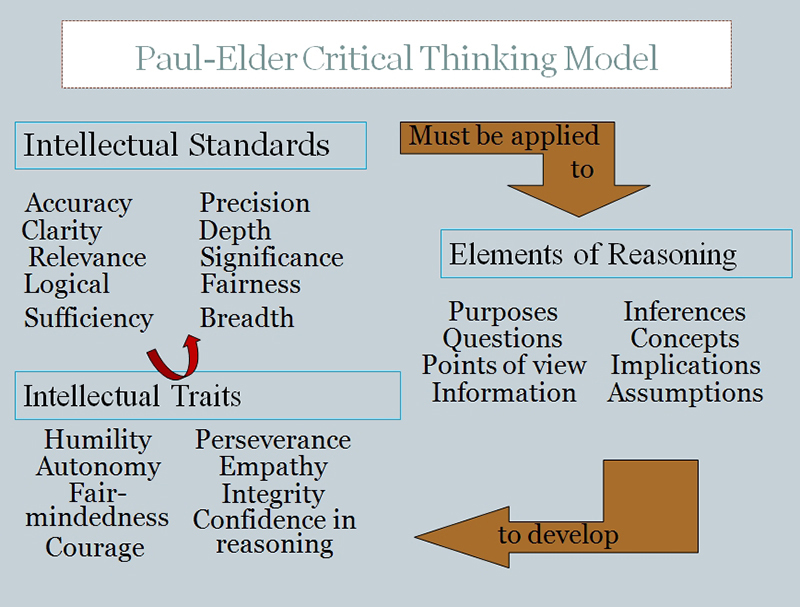 According to Paul and Elder (1997), there are two essential dimensions of thinking that students need to master in order to learn how to upgrade their thinking. They need to be able to identify the "parts" of their thinking, and they need to be able to assess their use of these parts of thinking. What factors make this difficult? Does all of this make sense together? Does your first paragraph fit in with your last one? Is my thinking justifiable in context? Am I taking into account the thinking of others? Is my purpose fair given the situation? Am I using my concepts in keeping with educated usage, or am I distorting them to get what I want? Paul, R. and Elder, L. (2010). The Miniature Guide to Critical Thinking Concepts and Tools. Dillon Beach: Foundation for Critical Thinking Press.